During the past 50 years I have learned a lot from sports coaches who use aspects of positive psychology. Beginning the week’s training before a match, for example, they encourage the players to give their best. They often give people the following messages. “The forthcoming match is about our performance. It is not about the opposition. “The match is not about our potential. 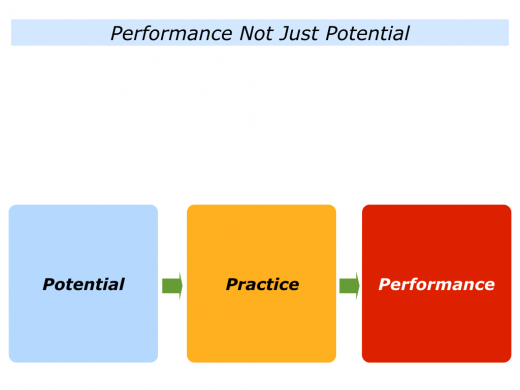 Many athletes have lots of potential, but only a few make full use of their talents. Peak performers often adopt a similar philosophy. Some are extremely talented in many areas, but these are the exception. Great workers often capitalise on one talent or combine a few talents to create something special. They apply their talent, build on what works and develop good habits. Great workers then learn how to give their best and perform on the day. 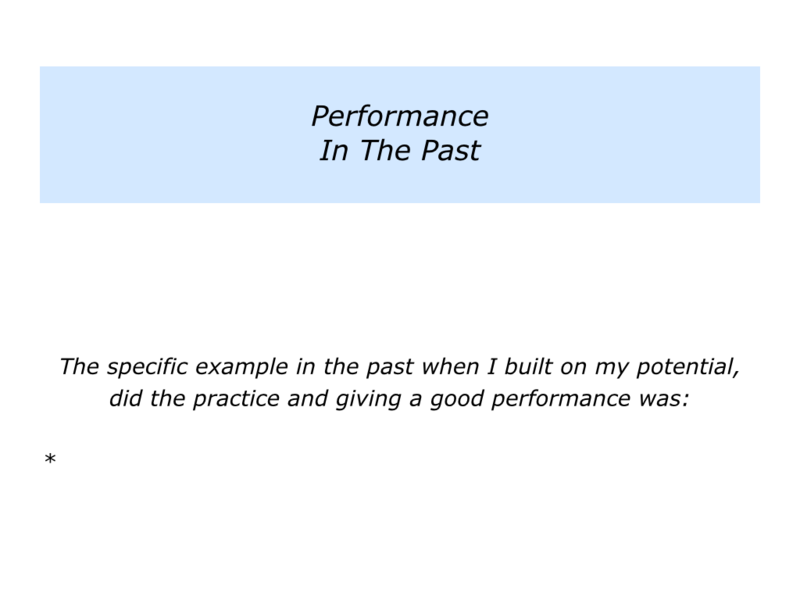 Describe a specific situation in the past when you built on your potential, put in the practice and gave a good performance. Describe the specific things you did to go through these stages. 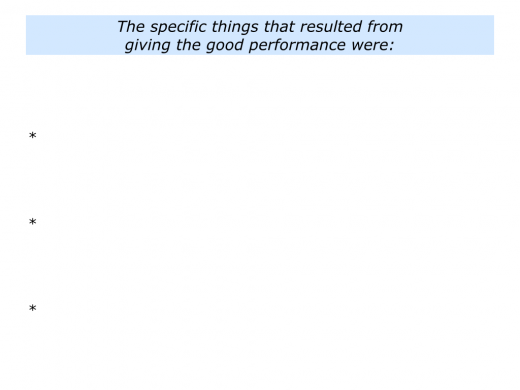 Describe the specific things that resulted from giving the good performance. Every person has talents. Some people are more talented than others, but everybody has gifts. Different people have different definitions of success. One revolves around the notion of becoming the best kind of person, artist, teacher, builder, athlete or whatever you want to be. People who are happy, for example, often aim to be the best they can be, rather than compare themselves with others. They believe that a rose can become a better rose, but it cannot become a daffodil. Looking at your own life and work, how can you focus on where you have the ability to do fine work? One approach is to pursue a passion in which you have the potential to achieve peak performance. How to choose such an activity? Here are several things it can be useful to consider. Choose a specific activity that gives you positive energy, even when you just think about it. Choose a specific activity in which you have the potential to deliver 8+/10. Choose a specific activity that you find fascinating, that you have a feeling for and in which you have a track record of finishing. Bearing this in mind, try tackling the following exercise on potential. This invites you to describe the following things. 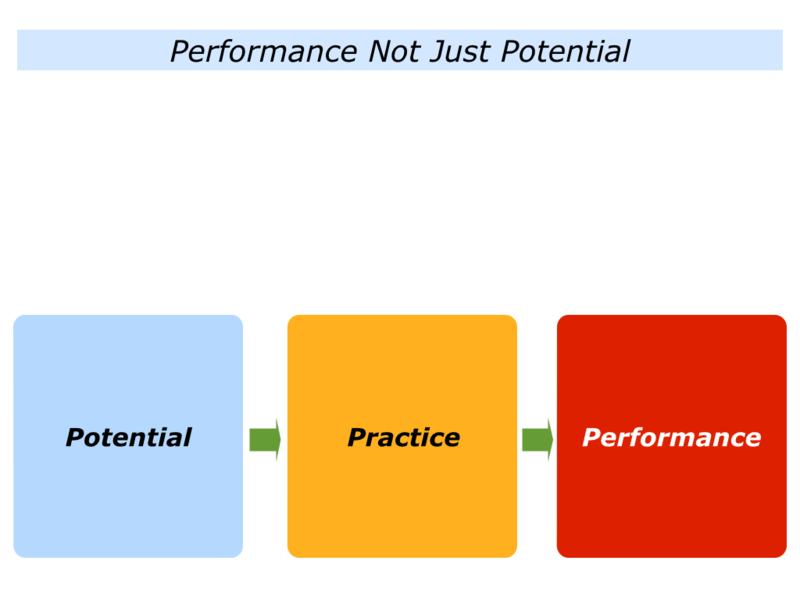 Great workers focus on purposeful practice, however, that is geared to achieving their goals. They often go through the following process. They clarify their picture of success. They continually practice following the key strategies that will give them the greatest chance of achieving the picture of success. Peak performers may do physical practice and often do mental practice. 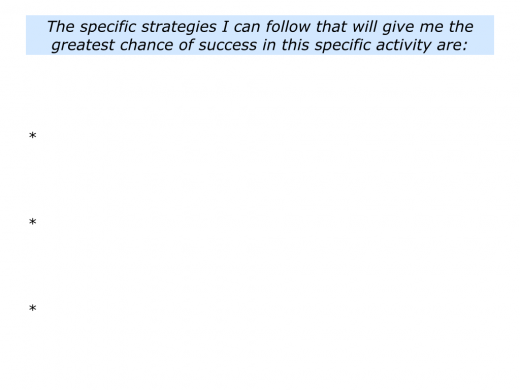 They continually rehearse how to pursue successful strategies in their chosen field. They also rehearse back up plans in case anything goes wrong. 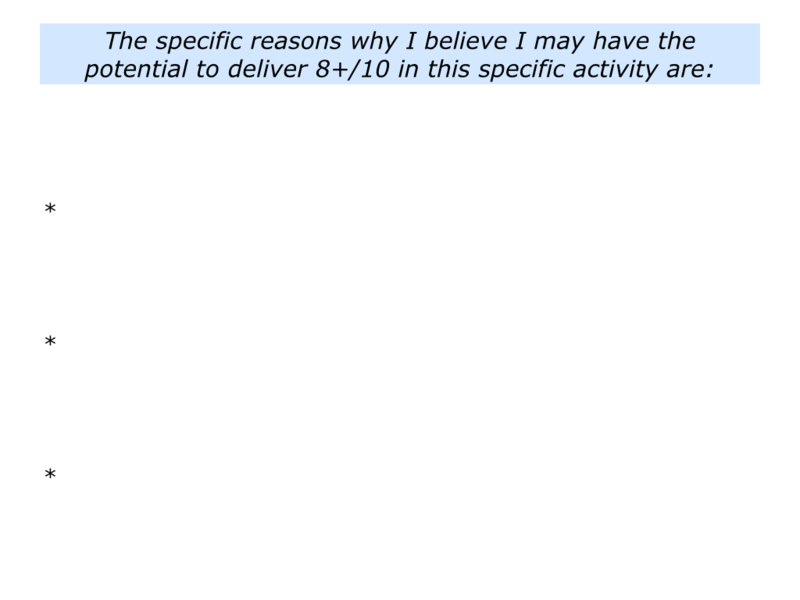 Imagine that you have chosen the specific activity in which you have the ability to achieve 8+/10. It can then be useful. 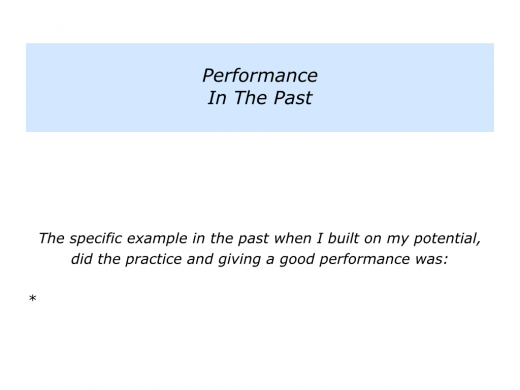 To practice the strategies and skills required to consistently give good performances. 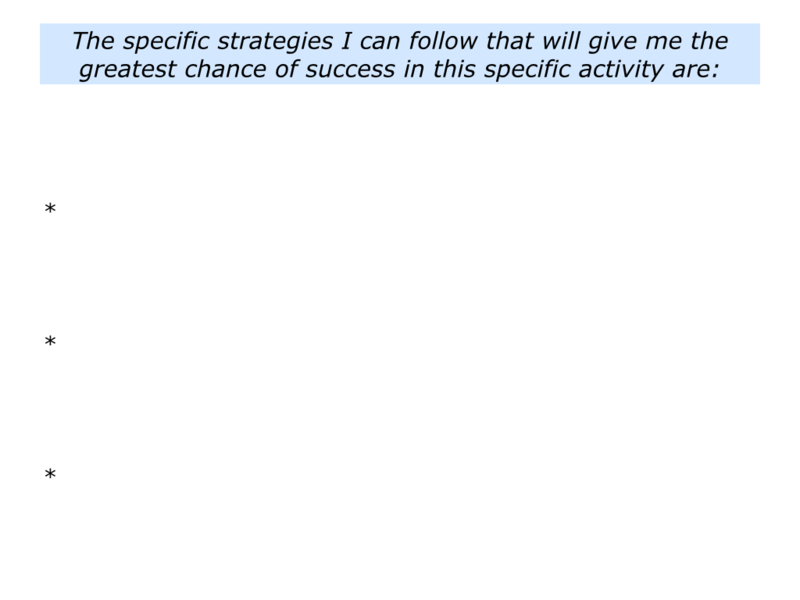 To practice the strategies and skills required to give a good performance on a specific occasion. 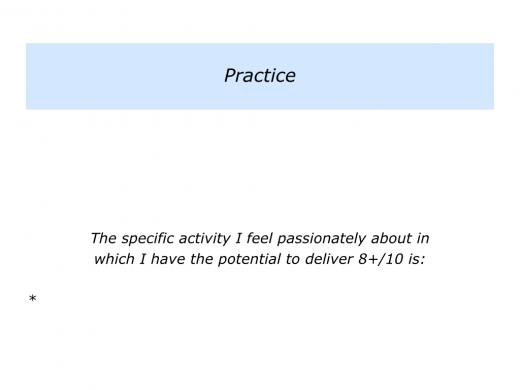 If you wish, try tackling the following exercise on the theme of practice. This invites you to do the following things. Performance in sports is about doing your best. Performance in many other fields is about doing your best to help other people. How to make the person feel welcome, clarify the topics they want to explore and agree on the goals for the session. How to focus on the topics the person wants to explore and clarify the real results they want to achieve. How to pass on knowledge and practical tools that enable the person to achieve success. You may follow similar steps if you are a trusted advisor, workshop facilitator, customer account director or whatever. Before meeting the people, you may do the following exercise. As mentioned at the beginning, lots of people have potential. The key is to give a good performance on the day. Looking ahead, can you think of a specific situation where you want to do your best? You may be aiming to play a sport, facilitate a mentoring session, give a keynote speech, run a workshop or whatever. 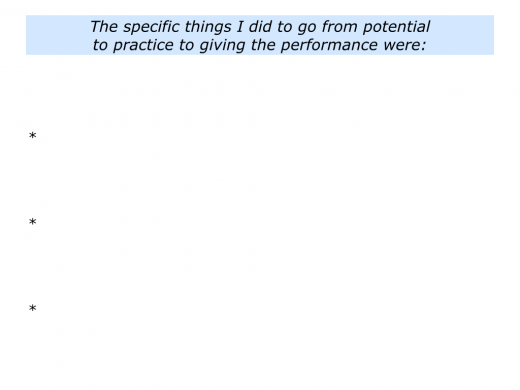 Describe a specific situation in which you want to give a good performance. 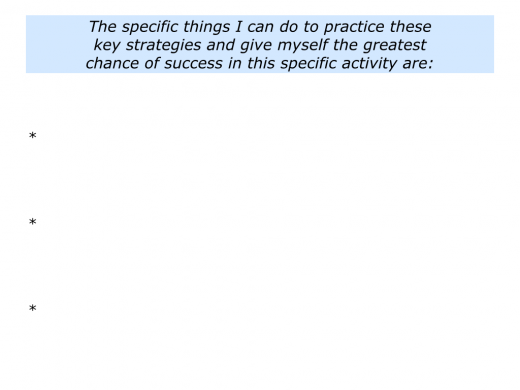 Describe the specific results you want to achieve in the situation. 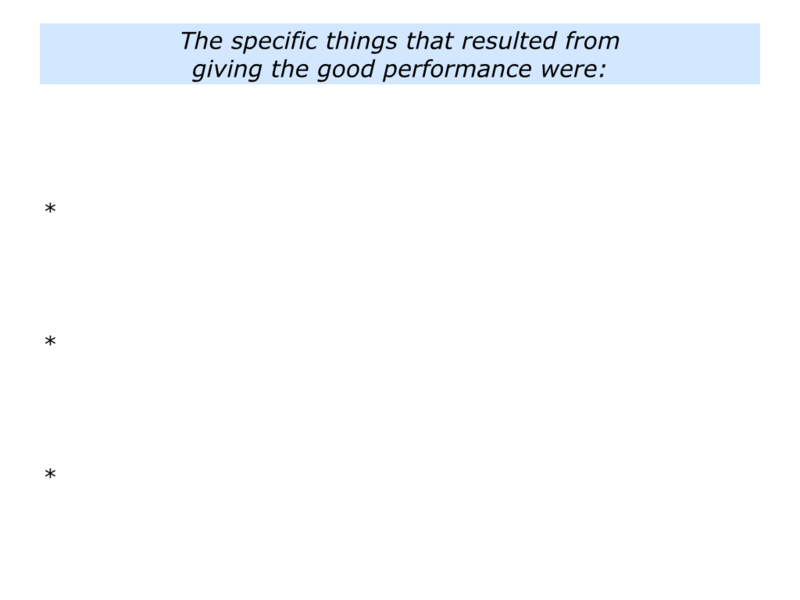 Describe the specific things you can do to do your best to give a good performance in the situation.